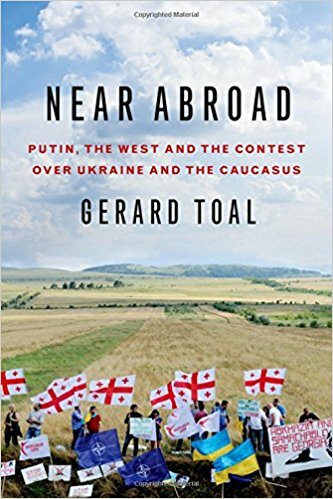 In Near Abroad: Putin, the West and the Contest over Ukraine and the Caucasus, Gerard Toal offers a detailed geopolitical account of the Russian conflicts with Georgia and Ukraine in 2008 and 2014 respectively. While questioning some aspects of the book’s analysis, April Curtis welcomes this as a highly nuanced work that will enable readers to have a deeper awareness of how Russia views its role in relation to its ‘near abroad’ and in the global world order. Near Abroad: Putin, the West and the Contest over Ukraine and the Caucasus. Gerard Toal. Oxford University Press. 2017. Gerard Toal’s Near Abroad: Putin, the West and the Contest over Ukraine and the Caucasus compares and contrasts in deep detail the Russian invasions of Georgia and Ukraine. The book makes a unique contribution to the conversation on this subject due to the fact that it clearly outlines the Kremlin’s thinking with regards to Georgia in 2008 and Ukraine in 2014 without undercutting Russian claims. In this regard, Toal rightly argues that understanding the conflict from the Russian point of view is not the same as justifying their actions. The perspective of the book is also rare due to the fact that Toal does not use a standard political lens when analysing the conflicts. Instead, the book is a critical geopolitical analysis that uses the idea of: 1) a geopolitical field: the sociospatial context of statecraft and the actors, rules and spatial dynamics; 2) geopolitical cultures: how states see the world, and; 3) the geopolitical condition: how technologies, both military and communications/media (such as images from a conflict), change how society experiences geopolitics. Throughout the book, Toal also emphasises the role of geography and history in both Georgia and Ukraine. He argues that even though Western politicians see the Russian aggression in black-and-white terms — i.e. an innocent independent state invaded by a bigger neighbour — the unique geographical and historical dynamics of Ukraine and Georgia make such a Western interpretation shallow and insufficient. Toal accuses the US of suffering from ‘thin geopolitics’. He defines this as thinking in terms of universal abstractions with little understanding of the complicated regional and geographical issues, and as being usually expressed in the form of moral dichotomies, i.e. good versus bad. However, this moral and legalistic approach to international problems is not necessarily as naive as Toal argues. Indeed, he fails to dig deeply enough into why exactly the US would think in this manner. After World War Two, international politics was supposed to have evolved from a system of land-grabbing empires into that of peaceful democracies. No one claimed that the way borders were arranged was agreeable to all parties, however: Europe as a whole had to accept the standing borders or another war would be inevitable. Russia’s blatant disregard for this principle concerns the US, not only because it violates its own ideals, but also because the US sees peace in Europe as fragile. The basis of Toal’s understanding of the Georgian and Ukrainian conflicts is that the legal doctrine of uti possidetis (‘as you possess’), which formed the legal borders of independent countries after the fall of the Soviet Union, did not address the complexity of dividing an ethnically diverse country with 70 years of interlinking infrastructure into separate sovereign countries. In this sense, Toal is correct. Uti possidetis in the post-Soviet space did not result in easy nation-building, and few, if any, in the West would argue that it was flawless. Yet, the issue with Toal’s criticism of this concept arises when he implies that this complicated heterogeneity of post-Soviet nations partly excuses the Russian invasion of Georgia and Ukraine. In the end, while the idea of uti possidetis did not automatically make strong countries, the fact that Russia does not respect internationally recognised borders is more detrimental to the stability of the region than the process which determined how post-Soviet states were created after 1991. Another problem with Toal’s geographical argument is that he frequently states that NATO’s expansion and the promises made to Ukraine and Georgia in 2008 at the Bucharest Summit triggered Russia’s actions. He claims that NATO ignored the issue of geography and the complexity of the region following the fall of the Soviet Union by expanding eastwards. On the contrary, NATO expanded specifically because of geography. Firstly, the former Warsaw Pact countries and Soviet Republics felt uncertain of their security precisely due to their proximity to Moscow. Their geographic location and experiences of being politically controlled by Moscow for the past seven decades incentivised them to apply for membership in NATO. In addition, Toal fails to give NATO’s new members any agency, and skims over the fact that these states made a conscious decision to apply to become part of the Alliance. Secondly, NATO allies accepted new countries because more stable neighbours make for a more secure Alliance. NATO membership required aspirant countries to reform in ways that made Europe in general, and NATO’s original allies specifically, more secure. Thirdly, independent countries are free to choose their military alliances, and therefore no amount of complex history gives a third party any veto with regards to Ukraine or Georgia joining the Alliance. Nonetheless, a positive aspect of the book is Toal’s refreshing inclusion of feminist thought. Toal argues that Vladimir Putin believed Russia required remasculinisation following the fall of the Soviet Union; if one is to look at the type of image Putin has created for himself, it seems clear that Toal is correct. As Toal argues, however, the US’s desire to act as the protector of small nations also carries masculine connotations. Unlike most other analyses, Toal furthermore focuses on the role played by emotions in the decision-making surrounding the two conflicts. These are important aspects to note because political decisions are not always taken because they will result in the greatest good for the nation. Figures such as Putin, Mikheil Saakashvili and Viktor Yanukovych are humans and therefore experience anger, happiness and the desire for revenge. When analysts divorce such important actors from their human characteristics, myths are created around the abilities and actions of the politicians, which can also prohibit a deeper understanding of the conflicts. Toal’s work is notable in the way that it analyses the human, not just the politician. 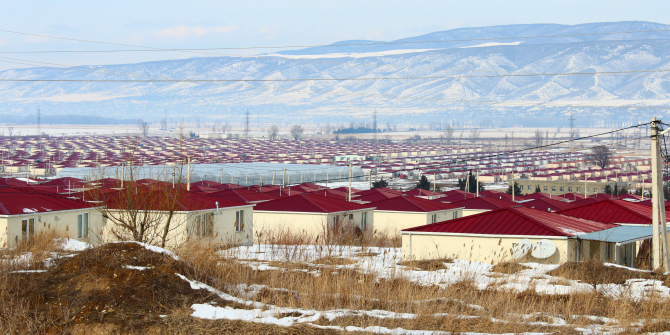 Overall, Toal offers highly nuanced and developed arguments about the crises in Georgia and Ukraine throughout his book: indeed, it has only been possible to address Toal’s overarching claims in the limited space of this book review. Whether the reader agrees with his perspective or not, the book is worth reading in order to better grasp the complexity of the situation in Ukraine and Georgia. Toal’s book addresses the reasons behind Russia’s actions, rather than whether the Kremlin’s activities were wrong or right. This type of study leads to a deeper understanding of the events, which results in a more complete awareness of how Russia views its role in its neighbourhood and in the global world order. April Curtis received an MSc in History of International Relations from the LSE. She is currently working at NATO Headquarters focusing on the Alliance’s relations with Russia and Ukraine. April is writing in a personal capacity and the review does not represent the views of NATO as an organisation.